We've all had to learn a few lessons the hard way, but it's far better to learn from someone else's mistakes. The Bible is full of stories we can glean from—positive and negative—about what to do and what not to do. Satan was filled with pride. Lot became complacent. And Achan let greed steal his blessing. 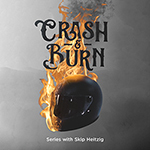 Join us for Crash & Burn as we learn to fly by looking at the lives of those who fell.